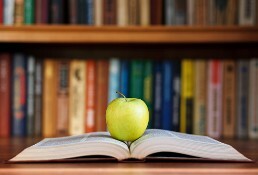 Supporting education has always been a primary goal of the Oak Ridge Human Resources Association. 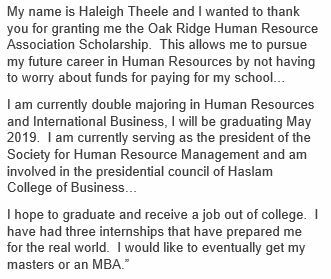 Through the generous donations of our members, ORHRA is able to partner with the University of Tennessee to award a scholarship to a student enrolled in the Haslam College of Business Human Resources Management program. The recipient shall have demonstrated a strong academic performance within this program. 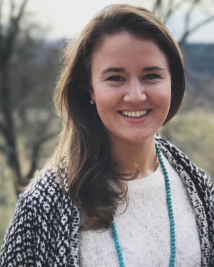 The University of Tennessee selects the qualifying recipient of the ORHRA scholarship. For more information on making a donation, please contact our ORHRA President, Krista Jones, or our ORHRA Treasurer, Jalene Morris. Congratulations and best of luck to all current & previous scholarship recipients!